Infrastructure you wish you had but couldn’t afford. Now available as a Service. Enterprise Advanced Cloud is an Infrastructure as a Service (IaaS) solution. It is unique on the market because it handles availability concerns even if your software does not. This is crucial for your business, especially if you use classic software. 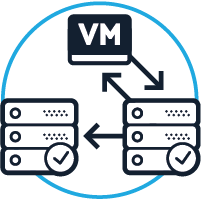 When you install a virtual machine (VM) in our cloud, it is automatically deployed in both data centers. No effort or configuration is required on your part. In terms of the CPU and RAM, your VM runs in one location at a time. In terms of storage, however, every file your VM writes is automatically and transparently stored in both locations. In fact, every written part of a file (called buffer) is immediately synchronised between the locations. The extremely high precision of the synchronisation and an automatic VM change to another data center in the case of local outages reliably prevent any data loss and ensure maximum availability. The uniqueness of Enterprise Advanced Cloud comes from its resilient architecture. It is built on top of two data centers that are connected by fibre-optic cables and located 10 kilometres apart. Why is this distance important? Because 10 km is far enough, even in the case of a major disaster, but close enough for maximum throughput and minimum latency to allow for real-time data synchronisation. With other cloud providers, you indeed have a choice of numerous data centers where you can run your VMs, however these VMs operate independently, and you have to handle all availability issues yourself. More importantly, if there is an outage at the data center, your software will also crash because other cloud providers do not have the mechanism to automatically relocate your VM to another data center. You can (re)write your software as a cloud-native app, i.e. software that has mechanisms that can move loads from one location to another in the case of an outage. For some software, such as database servers, one can configure clustering, but this is no trivial task. You can install disaster-recovery software yourself, which must be configured to copy the data to another location. In this case however – unlike our IaaS solution that provides you with real-time data backups – it is important to note that your data will only be copied periodically, and you will certainly lose some data in the event of an outage, major system crash or natural disaster. Additionally, you will have to manually restart the application from a backup, which may cause IP-addressing issues. You can also do nothing and hope for the best, but if your data center goes down, your software will also crash, which could have serious negative consequences for your business. Our solution is different because it handles availability issues for you, whether your software is cloud ready or not, and absolutely no effort is required on your part. Your data is automatically and transparently synchronised between our two data centers in real time. 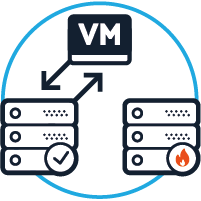 In the case of a data center outage, your VMs will automatically restart at the other location with no data loss whatsoever. Another unique feature of the Enterprise Advanced Cloud is that it is possible to move your running VM from one data center to another with no downtime and thus avoid any maintenance impact. With other providers, you would have to create a snapshot of the VM, and manually deploy it at another location, resulting in a temporal loss of service. The result: In contrast to the ‘high availability’ of other cloud providers, you benefit from the ‘highest availability’ with IaaS from Global Access. And this is completely independent of whether your software even meets such requirements! You would like to try out our IaaS? Our customers earn money with their apps. Therefore, all applications in our cloud function at 100% in productive environments – and not only for development or testing. We also actively help our customers outsource their business processes in the cloud. 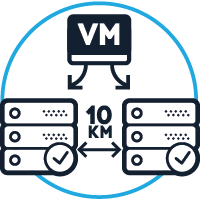 The moment you create your virtual machine in our cloud, your data are synchronised and replicated in two data centers in real time. This means your data will not be lost, even if one of the data centers has an outage. This even works if your classic application can’t handle the replication itself. No company can afford service outages. For this reason, we restart your machines the very moment something goes wrong. Our architecture guarantees the highest availability on the market. Enterprise Basic is a good option if you want high availability for the best price. House your data in either of our data centers, using exclusively flash-based solid state drives. Single-site IaaS makes sense for most performance-hungry apps. If you book a suite of cloud computing services, you can also combine Basic and Advanced however you want. Most cloud providers make you buy fixed, pre-configured virtual machines, making you pay for resources you won’t use. You have to buy the fries and soda when all you want is the burger. With the Global Cloud, you only pay for what you want. You can book, configure and manage any combination of RAM, CPU and storage along with networking, security and backup options. We call this resource pooling. It lets you redistribute your resources across your virtual machines however and whenever you want. Design and manage all of your top-quality virtual components just as you would with physical ones. This approach lets you make full use of our flexible hybrid billing model. We are the first Cloud in the world certified to BSI Baseline Protection. Never heard of it? It’s the German gold standard for IT security and the strictest in the world. You wouldn’t believe what the auditors made us do for this. But it was worth it to guarantee the highest possible protection and compliance for your data. We’re also NSA-free because we have no data centers, offices or affiliates in the USA. Don’t be fooled by other providers making the same promise—most of their claims wouldn’t hold up before a jury. The Global Cloud protects your data with top-quality encryption & antivirus systems along with Next-Generation firewalling, gateway security and micro-segmentation. Combine your IaaS with Cloud Storage packages, like Global Backup or Global Disaster Recovery.